Horizontal Blinds are some of the most versatile window coverings available. Few others offer the ability to regulate the amount of light entering your room or to vary the degree of privacy so effectively. Custom designed in a variety of materials from Aluminum to “Faux Wood” plantation style blinds; Wood, Faux Wood or Composite blinds can be upgraded to the “Easy Clean” option. “Easy Clean” allows you to pull each slat out of the blind for cleaning, eliminating the awkward chore of trying to clean between the cords. This custom blind design also eliminates the string holes thus the light from these tiny openings. Two inch Composite wood blinds are also available in a Custom “S curve” style. Here, the slats are curved to cup over the next slat providing an increased degree of privacy and minimizing the light seepage between the slats. The “S curve” also has the “Easy Clean” option. For those large “Picture” windows of up to 120″ wide, order our Custom 2 inch horizontal blinds in one blind from one of our long established Canadian manufacturers. Their modern styled 2 inch PVC venetian blinds match 2 inch Vertical blinds for that popular Picture window / Patio Door living and dining room combination. 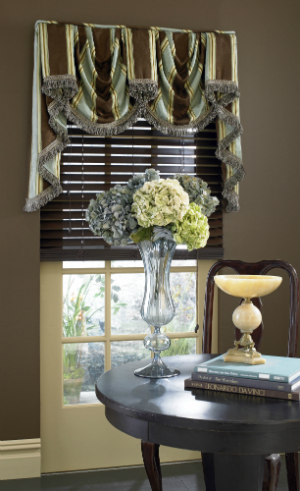 A custom drapery fringed Kingston Valance transforms a basic window covering into a style statement. Composite or Wood Alloy blinds are the most durable and stable of the “Wood” style blinds. They are not affected by humidity, do not warp, will not crack and are resistant to fading – definitely a plus in the Okanagan sunshine. Aluminum horizontal or venetian blinds are the lightest for lifting and available in 1/2 inch, 1 inch and 2 inch styles. See our exciting contemporary silvers, greys and copper colourations; all custom sized for your windows. Popular Faux Wood horizontal or venetian blinds are constructed of foam wrapped with plastic. A great look for a budget price, these are custom sized for you in either 2 inch or 2 1/2 inch styles.